Carlisle Bay is a dream destination for watersport enthusiasts and equally for those wanting to try new things and experience all that the clear, warm Caribbean waters make possible. The resort offers a comprehensive range of complimentary non-motorised watersports on site. These include kayaking, sailing, windsurfing, paddle boarding, raft-building and snorkeling. All are suitable for beginners and expert tuition and equipment is provided. Carlisle Bay also boasts a large free form pool and water sports centre with a scuba diving facility. PADI 4 day certified dive courses are held at our scuba dive centre as are our very special introductory dive courses (PADI Bubblemaker) for children from 8 years and over. 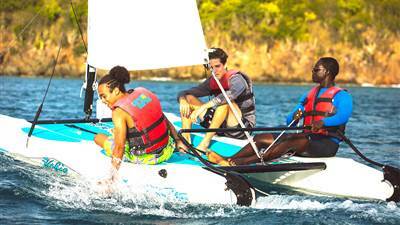 As you can see watersports in Antigua are a central feature of Carlisle Bay and everything has been provided to give our guests the best experience available.